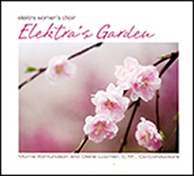 Elektra’s Garden is a collection of secular music from many parts of the world, including Spain, France, England, the United States and Canada. The music, much of it recently written, evocatively explores the human experiences of nature and love. Canadian composers Allan Bevan, Eleanor Daley, Allison Girvan, Diane Loomer, and Stephen Smith offer works ranging from new compositions to lyrical texts to exceptional folk song arrangements. The disc also includes two major suites: the delicate and deservedly famous Five Hebrew Love Songs by Eric Whitacre and Historietas del Viento (Stories of the Wind) from Spain’s Alejandro Yagüe (poetry by Lorca), which was written for Elektra.